Making a yearly trip to Myrtle Beach is often a family tradition for many. Staying at the same resort each year can easily become part of your family tradition. 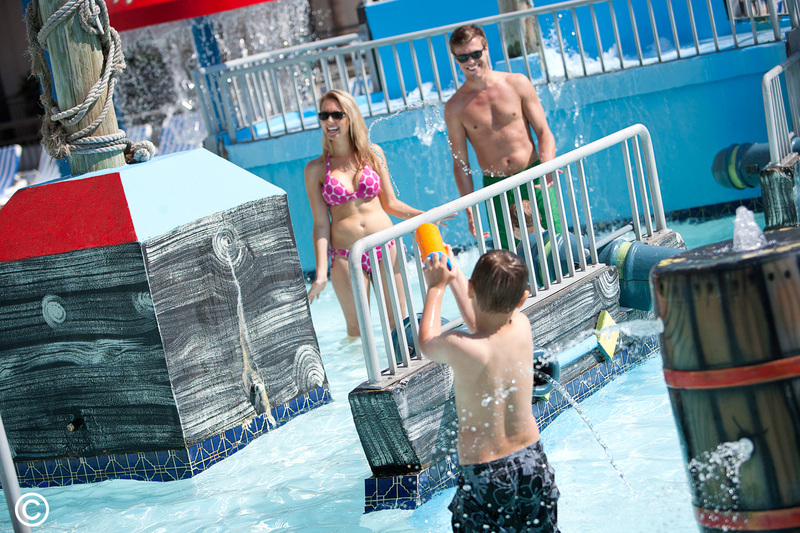 Amenities: Our amenities were created around the idea of family fun! Our Shipwreck Lagoon Kids’ Waterpark, indoor and seasonal outdoor lazy river, seasonal Loco Gecko Beach Shak, 20-lane bowling alley, giant arcade and summer activities make for a fun, annual vacation. Whether you choose to take your vacation during the summer when Myrtle Beach is bustling or during the quieter fall or winter school breaks, there are plenty of amenities to be enjoyed. Best of all you don’t have to leave the resort during your stay if you don’t want to! Value: By staying at our oceanfront resort, you will get a lot of value out of your hard-earned vacation money. While all of our Myrtle Beach accommodations have at least a mini fridge and microwave, our efficiencies and suites come equipped with kitchens, making it easy to save money by cooking some of your meals in or preparing inexpensive snacks for a day at the beach. Plus, with our oceanfront location, you can easily enjoy Myrtle Beach’s best free amenity: the beach! Looking for shells, playing in the waves and building sand castles are both fun and free! Lastly, all guests of Captain’s Quarters Resort receive the free VMB Card at check-in, which will get you discounts at tons of local attractions, restaurants, shops, services and more! Going on vacation does not mean you have to spend a lot of money. Location: Our location is perfect for Myrtle Beach visitors. We are just a short drive from the Myrtle Beach International Airport (8 minute drive), The Market Common (9 minute drive), Broadway at the Beach (10 minute drive) and so much more. If your family enjoys walking you can walk to nearby businesses like restaurants and beach shops or take a stroll down the beach and check out the Second Avenue Pier (18 minute walk) where the south end of the Myrtle Beach Boardwalk begins. Or, during the summer months you can easily walk to Family Kingdom (10 minute walk), a popular nearby amusement park. With so many nearby attractions and shops, you don’t have to go far to have fun during your family vacation. Kid-Friendly: So much about our resort is kid-friendly, making it a great option for families traveling with children. Parents love the indoor pool complex where they can sit back and relax as they watch their children frolic in the shaded, kid-friendly indoor pool, which ranges from 3 feet to 5 feet, or float down the 3.5-foot-deep lazy river, all within eyesight of the center of the indoor pool deck. The shallow Shipwreck Lagoon Kids’ Waterpark is open year-round, and it is a popular option for outdoor swimming featuring dump buckets, a pirate ship and more. Once your family is done swimming you can take a break indoors at the Level 6 Entertainment Center, which is complete with 20-lanes of bowling (and bumper bowling for the kids!) as well as a large arcade. Kids will never get bored at Captain’s Quarters! Learn more about why we were named the Most Kid-Friendly Hotel in Myrtle Beach here. Memories: Vacation is something your children will remember for years to come. By creating a tradition for them of vacationing at Captain’s Quarters each year, it will not only give them something to look forward to each year but it will also give them priceless memories from a resort that is a special place where the best childhood memories are made. Once your children are grown they may even continue this tradition with their children. Your kids only have 18 summers for a family vacation before they becomes adults, so be sure to make the most of this previous time! What is your favorite reason for having Captain’s Quarters Resort as you annual vacation destination? Comment below or check out our Myrtle Beach deals page to start planning your family-friendly Myrtle Beach vacation today!